Enter the magic of lush native Hawaiian rain forest, a world of its own. Be enlivened as you step into an exquisite canopy of giant tree ferns and lofty Ohia trees. The living spirit of the forest casts a spell of enchantment and peace on guests lucky enough to find their way here. Soft damp mosses and fragrant ginger create a gentle contrast to vibrant energies of ancient volcanic rock. Breathe in the sensitive relationship between the collection of rain forest cottages and the spirit of the land. 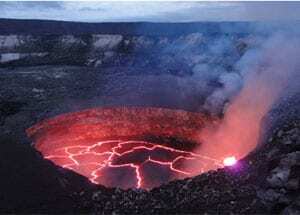 Feel the primal mana (power) of Hawaiian ancestral forces protecting the aina (land) and those who dwell on it. Be sheltered in the cottages, each blessed by Hawaiian elders (Kumu) and the Hawaiian cultural traditions of hula and chant. Along mystical mossy paths, discover and be charmed by hidden treasures, creations of local artists inspired by archetypes of the culture and life of the land. After a day of adventure in Hawaii Volcanoes National Park, retreat back to your Volcano lodging and enjoy the B&B’s soothing and relaxing hot tubs. Unwind with a traditional Hawaiian Lomilomi massage and drift to sleep under the magic of the Volcano night sky. Wake to melodic birdsong and enjoy a delectable complimentary breakfast in the privacy of your upcountry guest cottage, 3800 feet above the sea. Or simply kick back and let rainforest shades of deep jade and gentle chartreuse embrace your soul. Allow your senses to be refreshed by cool mountain air, misty rains and expansive blue skies. Experience the creation of an island in the middle of a deep blue sea. Touch the newest land on earth. Be one of our guests from around the world who savor the abundant diversity of geography and climate that make the Big Island a wondrous adventure. From volcanic slopes and snowy summits of Mauna Kea and Mauna Loa, orchid farms, botanical gardens and waterfalls, breathtaking scenic drives along cliffs that fall to a turquoise sea, deep valleys and black sand beaches with green sea turtles, hot ponds and palm trees, rural coastline vistas, rainbows and sunsets, to olivine shores and the southernmost land of the island. Experience the true spirit of ‘aloha aina’, love of the land. Take ‘down time’ for yourself, read a good book, nurture one another and your relationship, curl up by the fireplace, take a nap under the treetops, leave your stresses behind, reflect on and celebrate the blessings of your life in this sheltered retreat, where time can stand still and impart a meditative and peaceful quality to the moments of your day. Restore a deeper connection to yourself and the ones you love. “Your warm, inviting, comfortable sanctuary was the highlight of our trip. 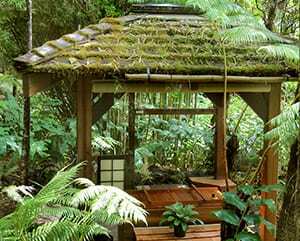 This jewel nestled in the rainforest truly exemplifies Aloha”. “Thank you for making our honeymoon getaway unforgettable. The past four days have been pure bliss. The Volcano Rainforest Retreat is the perfect blend of a place to completely relax and a jumping off point for cool adventures”.